Explanation: The comet PanSTARRS, also known as the blue comet (C/2016 R2), really is near the lower left edge of this stunning, wide field view recorded on January 13. Spanning nearly 20 degrees on the sky, the cosmic landscape is explored by well-exposed and processed frames from a sensitive digital camera. It consists of colorful clouds and dusty dark nebulae otherwise too faint for your eye to see, though. At top right, the California Nebula (aka NGC 1499) does have a familiar shape. Its coastline is over 60 light-years long and lies some 1,500 light-years away. The nebula's pronounced reddish glow is from hydrogen atoms ionized by luminous blue star Xi Persei just below it. Near bottom center, the famous Pleiades star cluster is some 400 light-years distant and around 15 light-years across. Its spectacular blue color is due to the reflection of starlight by interstellar dust. 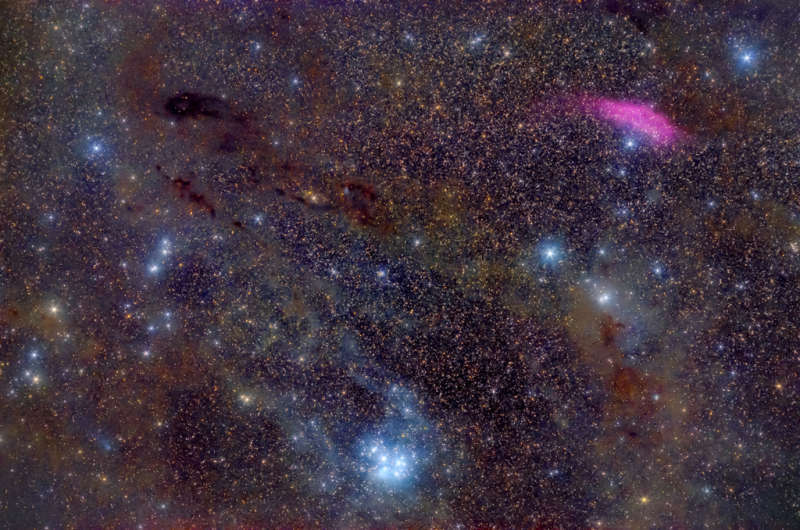 In between are hot stars of the Perseus OB2 association and dusty, dark nebulae along the edge of the nearby, massive Taurus and Perseus molecular clouds. Emission from unusually abundant ionized carbon monoxide (CO+) molecules fluorescing in sunlight is largely responsible for the telltale blue tint of the remarkable comet's tail. The comet was about 17 light minutes from Earth.